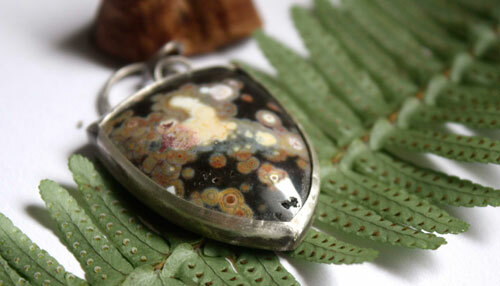 This pendant is made of sterling silver (925) made by hand in my workshop, and a beautiful ocean jasper from Madagascar. Juuri is set with a simple design because I thought it was sufficient for this beautiful ocean jasper. 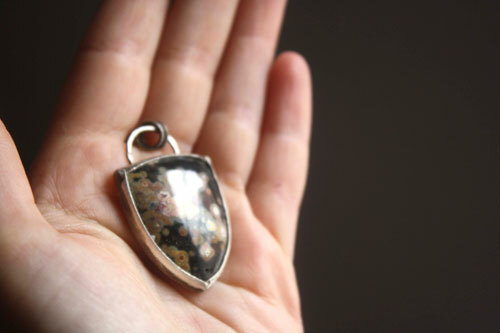 The shield-shaped cabochon is mainly green in different tones, and with white, cream and red spots. 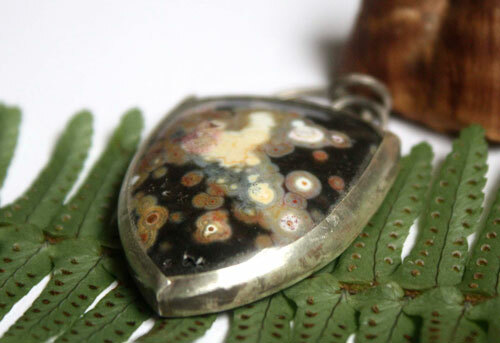 It has many orbs, circular spots, characteristic of ocean jasper. 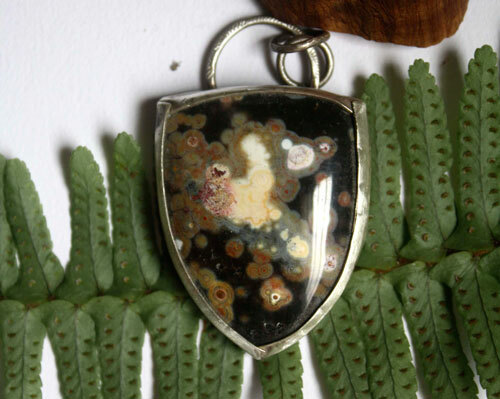 This ocean jasper remembers a boreal forest that we would see from the sky. The circular green spots represent the pines and firs. This forest has a few clearings that can be seen in the lighter spots, unless both trunk white birch, national tree of Finland. 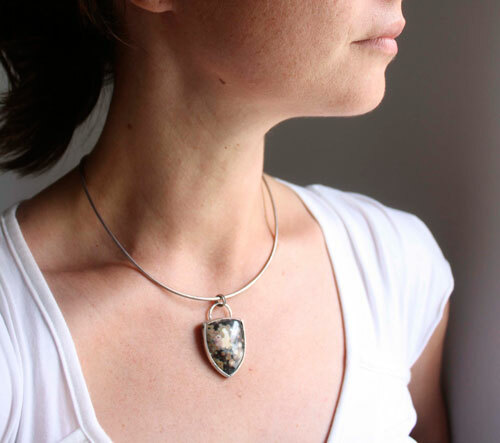 To recall this idea, I sawed the shape of a fir tree at the back of the cabochon. It also allows appreciating the back of the stone. 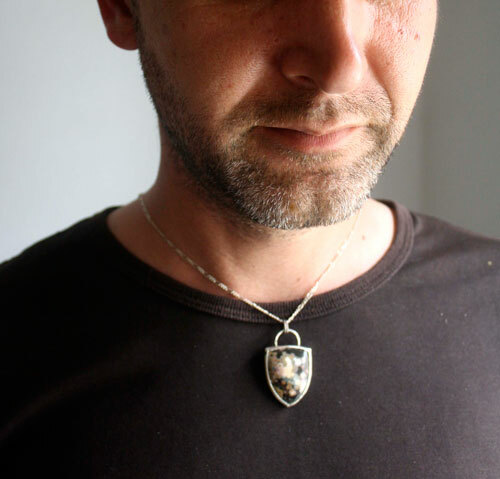 I named this pendant Juuri, which means Just in Finnish. The surface is 4.5 x 2.5 cm. 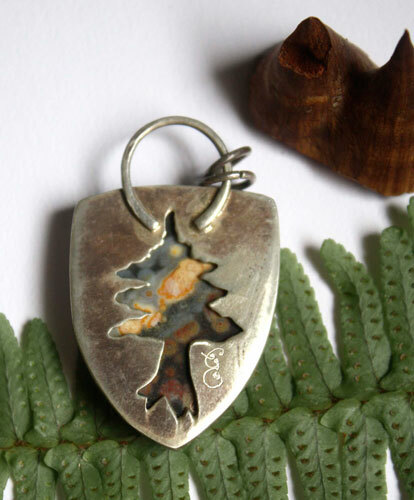 Tag: pendant, sterling silver, man, unique, ocean jasper, gift, valentine, mother’s day, birthday, cabochon, semiprecious stone, tree, nature, forest, pine, Boreal, Finland, north, quiet.